If you’ve been following my Fiction Series, you’ll know we’re waiting for the Expansion, and that portents are already forming of something out of the ordinary from the Blasted Lands. This is the moment where it is time to introduce you to the rest of P and Crais’ five man team, and to start giving a little background to their lives as well as those you already know. Without further ado, it’s time for a series. To get yourself prepared, read the Prologue to this opening episiode here. A link to the previous series, Origins, is here. Disclaimer: All these people live in a computer game owned by Activision and Blizzard. The one I play is mine in my mind only. We wouldn’t be here if it were not for M, who ironically has become my boss James Bond stylee because without him there IS NO MISSION BRIEFING. Many thanks for forcing me to make sense, and helping an understanding of a larger Universe as a result. Fizz Goldfellow mutters as he sits on the supply crate, legs not even making it to its edge, staring with mounting irritation at the Dark Portal. It remains as it had since he arrived three days ago, as consistent and natural as a gateway to another part of Space could ever be expected to appear. They are undoubtedly the same stone guardians, the steadfast swirling green lake of fel-generated sorcery. The scene around them, however, is nothing short of organised chaos. Two armies fill the area, a strip of well-trodden, dusty red earth dividing as uneasy peace binds. In the cold early morning only the occasional strikes of lightning to the north disturb the silence, the soldiers and workers still asleep in hastily-reinforced encampments constructed along and up the crater walls, patchworking landscape over and across contested territory all the way back to the Swamp of Sorrows. Even if Fizz can’t see any change in the Portal itself, he can taste the alteration in the fabric of reality: this place is no longer the same, not by a long way. His perception was only part of a body of mounting evidence: the Cultists who had settled here after the Cataclysm vanishing without trace a week previously, the demons that they worshipped also disappearing suddenly and inexplicably. This is a sign, no doubt about it, but of what remains to be seen, and Fizz is no fan of waiting for anything. The Tauren on patrol across the divide raises a hoof in greeting, a gesture Fizz welcomes as something positive during his last minutes on watch. Herne is his name, Goldfellow remembers him and his sister from Orgrimmar. Their memory prompts a warm smile and a large wave, despite not wanting to think of the recent past, the uncomfortable feeling it gives him from beard to toes. Mind games are normally his speciality and to have himself played during the Siege was an uncharacteristic sign of weakness. To be victimised by, of all things, an Old God… not since C’Thun had he been so deluded. That was probably the reason he detested sand as much as he knows he still does. The disappointment in the voice to his left turns smile into impish grin, despite himself. Of all the people he’d never expected to share his annoyance, Alyse was pretty much at the top of the list. 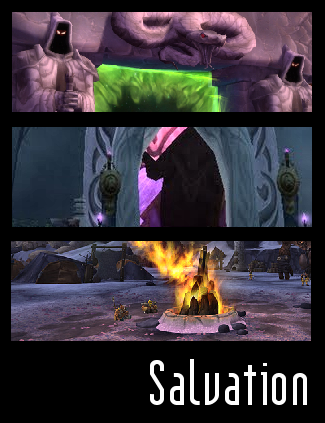 The Night Elf dejectedly slumps down at his side on another crate, almost shoving his early morning tea into his hands. Aromatic warmth makes his small hands tingle and nose twitch. Fizz knows Master Crais and his Party Leader are wrapped tightly to the Portal’s pull, and he has his own theory as to why. The desire to cause mischief, even this early in the day, rises unchallenged. He turns to the Priest with his most suggestive leer firmly fixed in place. Six months ago Alyse would have slapped him across the face just for the suggestion. The strength of camaraderie that ties them, however, is enough for him to simply suffer a dead arm and consider it a worthy response. She didn’t really punch him that hard either, and Fizz knows he can push his luck with her without worrying she’ll take it badly. If it were any other day she’d then argue he should respect her enough not to do it to begin with, but it’s just after dawn and she’s clearly too preoccupied to care. He’s reminded again of the last days of Orgrimmar, her weariness when she thought no-one was watching, and the past tastes bitter in his mouth. He sits silent, waiting until she relaxes, ready to protect her as he had when they’d stormed the city. Those last days under the Horde Capital had changed many things, not least the strength of their commitments to each other. The five had never decided a name for themselves, even when Admiral Taylor had prompted they should, so she could use them as a symbol of what the Alliance had wrought from the chaos. He doesn’t want to be known as anything except a Gnome with a talent for the Arcane. But now he has a designation, along with the priest, the paladin, the rogue and the hunter. They are collectively referred to as ‘Salvation’ by the Alliance public relations machine, and that is why they’ve been here since what the same body is calling the ‘Blasted Lands Phenomena’ began. Being present, however symbolically for now, is undoubtedly good for Stormwind’s flagging morale. With the Priest present that means his tenure for the night is complete: with the briefest of touches to Alyse’s shoulder, Fizz climbs off the box and heads back to his tent. He understands the public face is all that really matters at this juncture anyway, yet he doesn’t enjoy being made into a metaphor for anything. Walking away, he turns to stares back at the Portal and yet again wishes he understood more about what was to come. He stops dead as he sees a figure materialise at the event horizon.